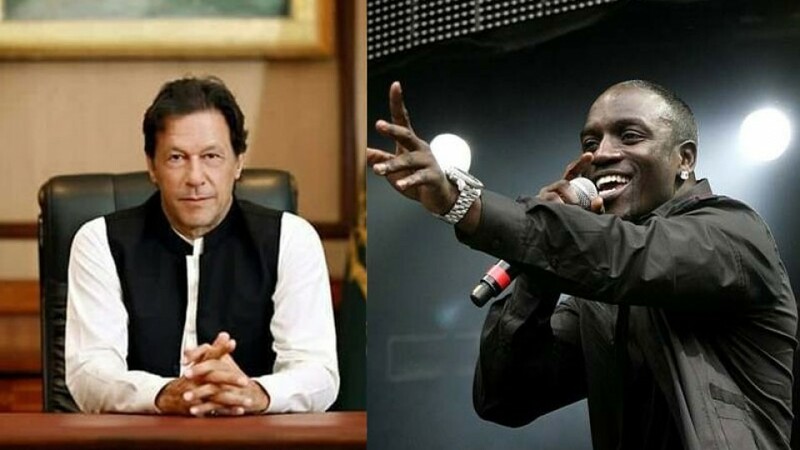 When we talk about Pakistan fashion industry, it is impossible to miss the name of Asim Jofa. 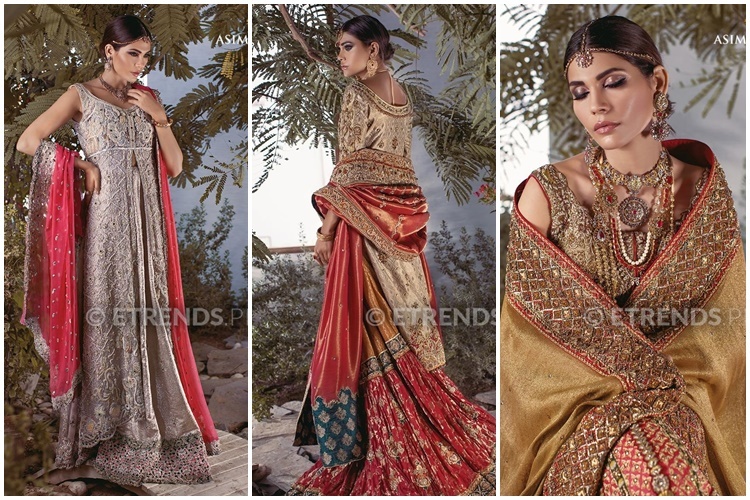 His latest bridal collection will definitely make you forget blinking your eyes. 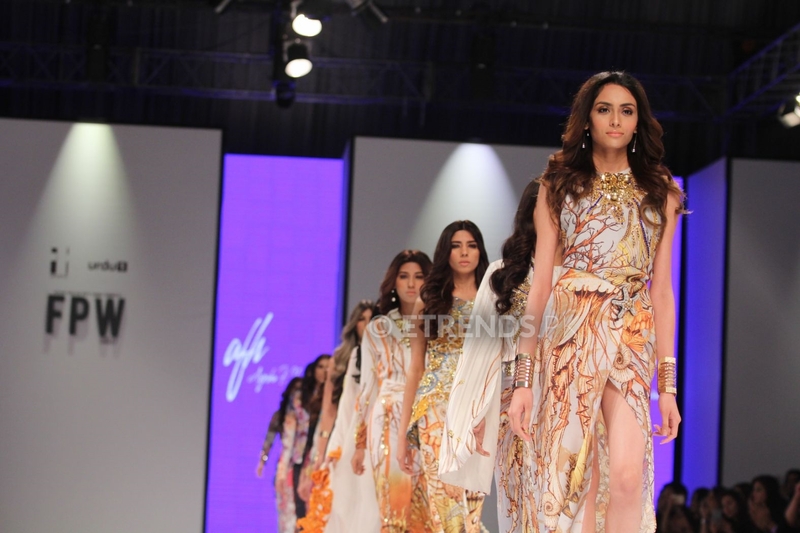 Asim Jofa is no doubt amongst the best designers of the Pakistan fashion world. 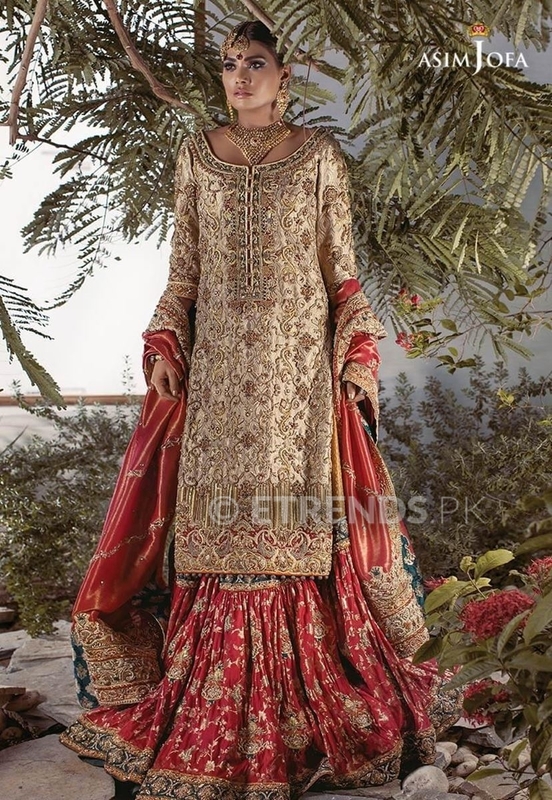 In this striking collection the designer is offering with the marvelous looking bridal wear dresses designs that is featured up with long shirts and medium shirts alongside with lehngas. Light baby pink sleeveless net gown back trail style with beautiful silver work in kora dabka, and pearl work all over. Top front and back of the dress is composed of heavy work with vertical lines at the back and motifs scattered all over the dress. 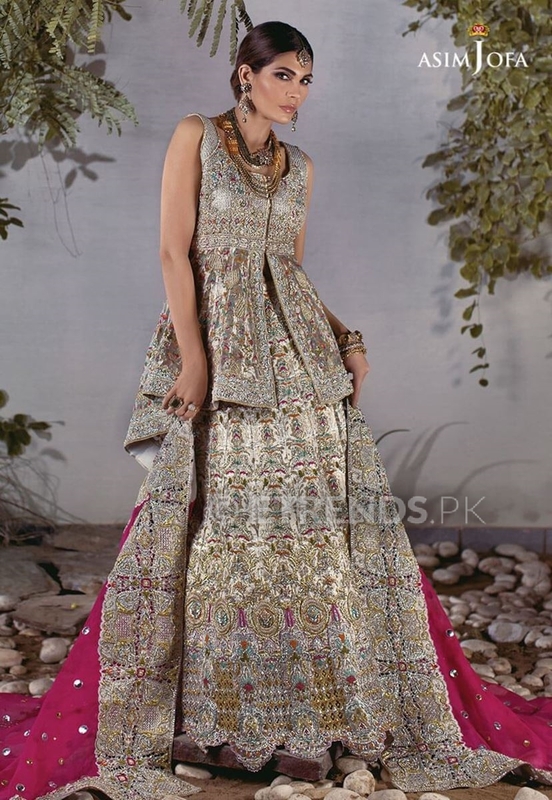 It comes with Light baby pink sharara with cut work border in pink green and silver. 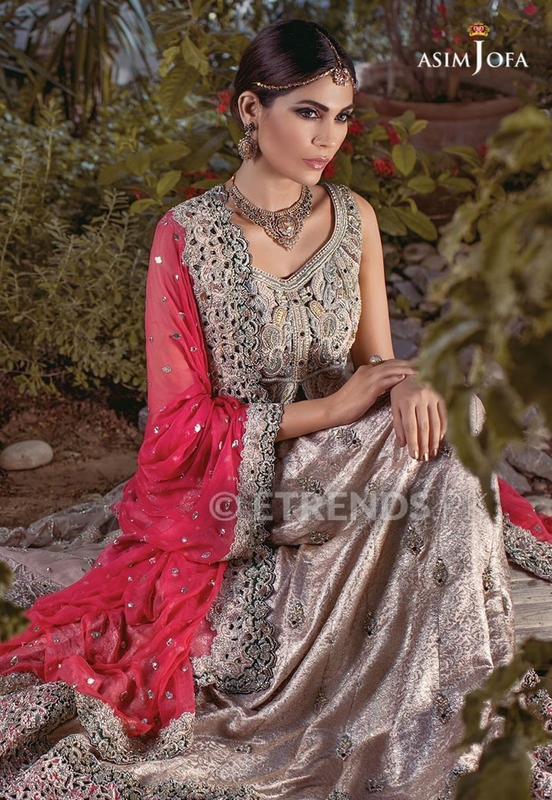 Pink coral color chiffon dupatta with silver kamdani scattered all over it and also with silver cut work matha patti and 3 sides border making it a perfect bridal dress. 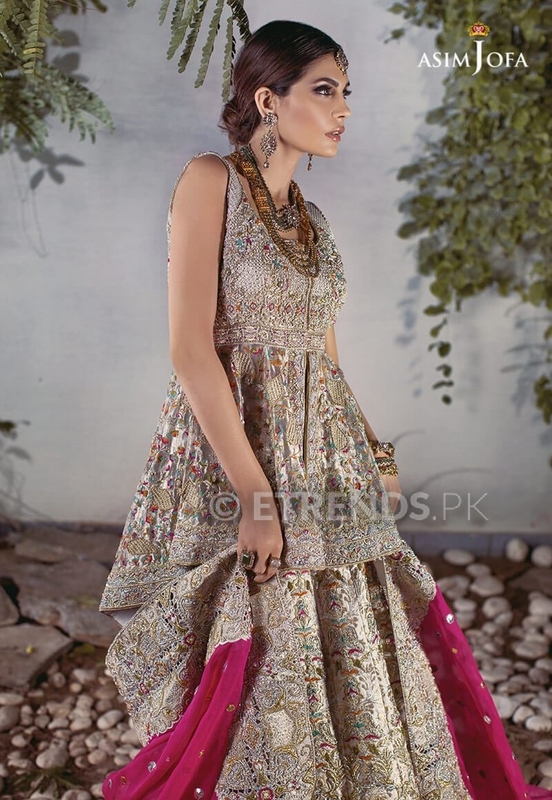 Off white heavily embroidered front open bridal peplum style shirt with heavy multi colored embroidery all over the front and back of the shirt featuring resham, kora and dabka with golden details. 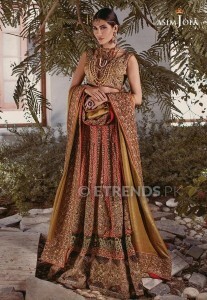 It comes with Banarsi Lehnga with full heavy multicolored and gold embroidery with embroidered motifs all over it. Finished with beautiful heavy cutwork border, cancan and a trail. It is paired with a Shocking Pink dupatta with heavy matha patti border and cutwork borders on other 3 sides with chan sprinkled all over the dupatta. A perfect bridal wear making your big day more memorable. Golden color heavily worked shirt with gold embroidery work all over it presenting work in kora dabka pearl and sequins. The daman of shirt compromised with beautiful heavy embellished borders on the front and back. It comes with red farshi gharara in jamawar paincha and mustard gote with embroidered motifs in gold all over it. Finished with beautiful heavy dark green appliquéd border and also same border on the goat of gharara. 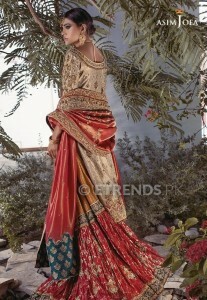 It is paired with a red dupatta enhanced with golden appliquéd heavy embellished borders on all 4 sides. 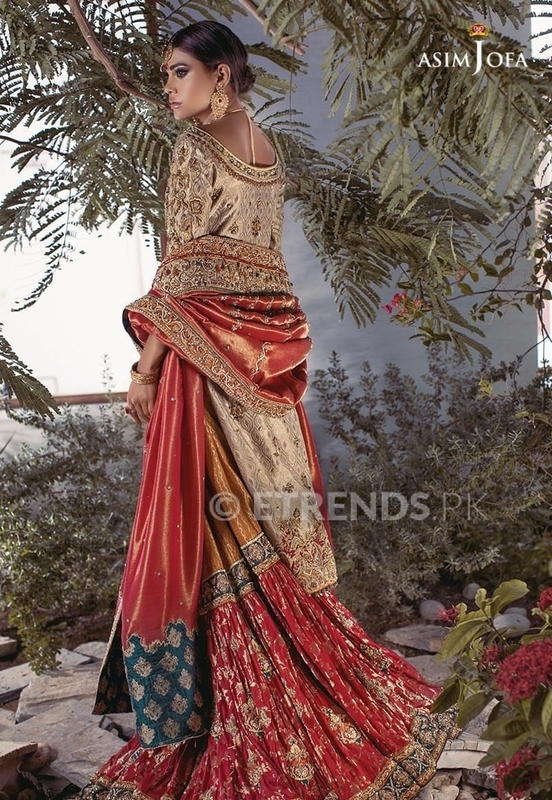 If you are curious about color and design you must check this bridal wear by Asim Jofa. I am sure this dress will take your heart away. 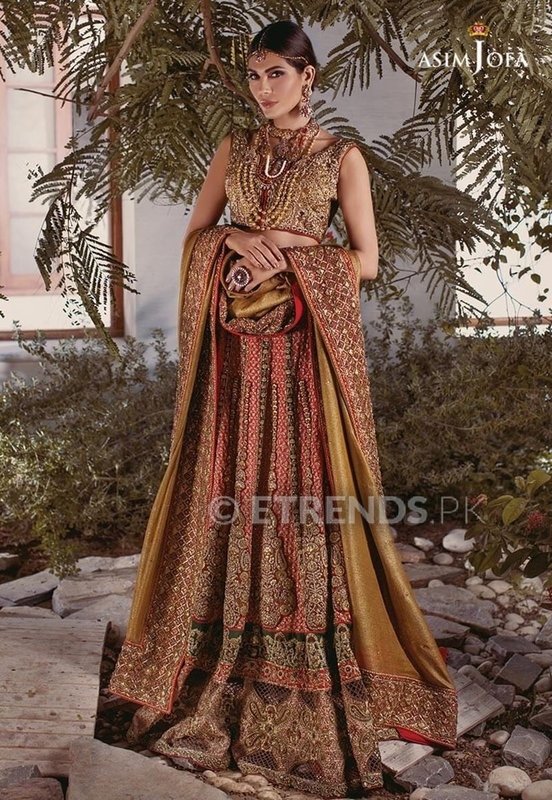 Gold color heavily embroidered choli highlighting gold work on front and back in kora dabka, sequins, kundan comes with a red sharara with beautiful embroidered motifs around the edge and vertically worked gold lines and it finished with a thick appliqued embellished border. 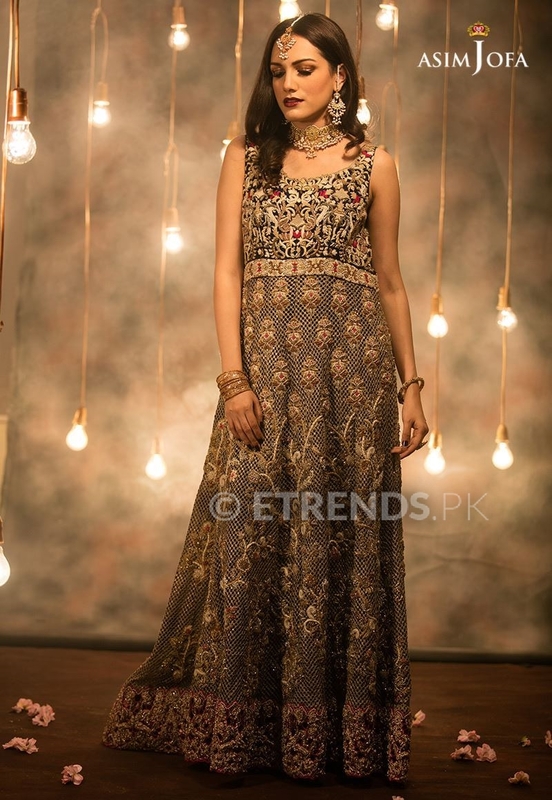 This dress is attractively matched with bronze mysori dupatta with sequin spray all over. The dupatta has heavy embellished appliquéd borders on all four sides. 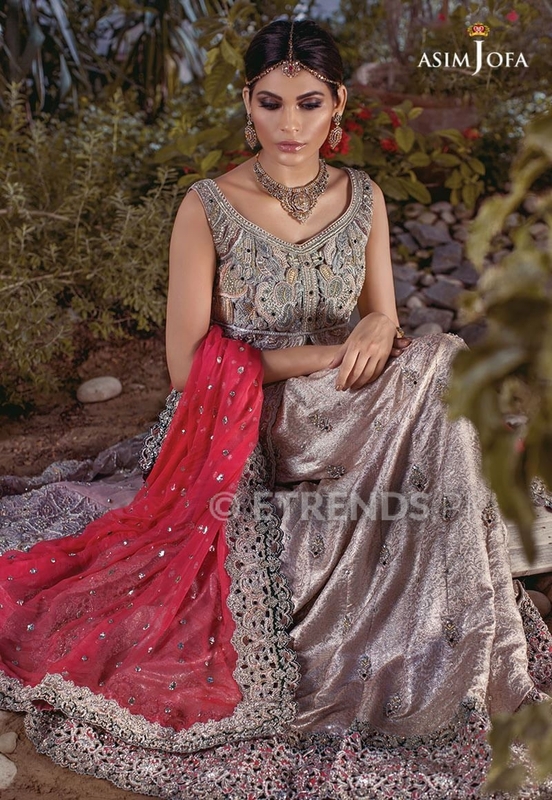 Get yourself the best bridal dress from latest bridal collection by Asim Jofa. Navy Blue long bridal gown with trail. Embellished with gold and silver kora, dabka handwork all over. Beautiful hand embroider body with embroidered waist belt attached to fully worked panels, finished with hot pink embroidered cutwork appliquéd borders on all over the front and back hemline. It comes with navy blue pants with handwork on it. Mawra Hocane Unveils Her BB Cream Secrets!